Our Products >> "Trinity Ring"
This is one of my favorite rings for women who like low profile, easy to wear casual or daily use rings. It is also a wonderful pinkie ring, and I make it all the way down to a size 3! 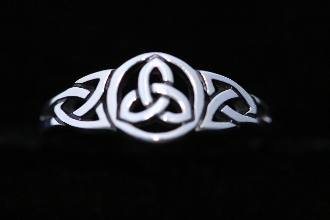 The classic Trinity is a symbol named for the Holy Trinity, and is one of the most recognizable images in all of Celtic design expression. There are many other elements in the celtic belief system which embody the trinty format. Some of these include: Life, Death and rebirth as a part of the eternal cycle of life, and there are the Bardic tradion of poetically describing the elements as Earth, Sea and Sky, as well as in line with the older triskele expression of the "Triple Goddess" of Maiden, Mother and Wise Woman. Animals, Gods and Goddesses all had 3 primary aspects, adding a very full range of potential meanings to this classic pattern. The added circle around the trinity in this design is a simple variation expressing the circular aspects of life contained in the life, death and rebirth process. The circle also protects your hand from the points of the pattern, making the ring comfortable to wear.